Day 26: Is yoga giving me hives??? I have hives on my hands again. Itchy ones. I can’t figure out what is causing it! However I am beginning to wonder if it is my yoga mat. I only seem to get the hives on my hands and have noticed that I seem to have hives around the times I do a lot of yoga. I suspect I have a mild latex allergy (which was discovered in a much more personal way that is out of the scope of this blog). 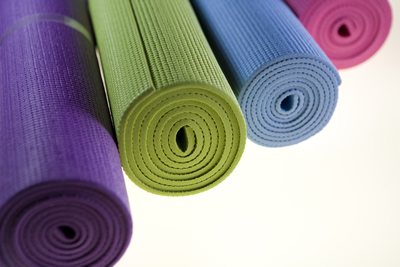 Most yoga mats contain latex. Anyway. I am going to try doing yoga without a mat to see if the hives go away. Then I will bring the mat back into and see what happens. I’ll let you all know how it goes!! I am curious about doing yoga without a mat anyway. They don’t use mats in India. My partner was in his third year of his teacher training before he ended up with a yoga mat. I just finished a week of itchiness and hives from the bottom of my hands to everywhere. I am now trying to figure out where it came from and also thought my yoga mats or a new yoga shirt could be the cause. My mat is Eco friendly and made from TPE which is a combination of things. The shirt which I only wore quickly for 2 minutes was made of Modal. Has anyone else had similar symptons using a yoga mat and/or Modal material in their clothes? My wonderful Lulu mat gave me a brand new latex allergy (I think) after about 10 uses. I broke out in hives every time I used it, and the third time when my tongue started to also swell in a really nasty attack I decided to ditch the mat. Went back to my Target pvc one and then today found a new brand in Whole Earth Provision that is pvc, all those plasticy chemicals, and latex free. Latex allergies can be very scary.